The University of Toledo College of Engineering and AAA Northwest Ohio are hosting the second in a series of free, public talks to educate consumers about how smart cars will impact the world. 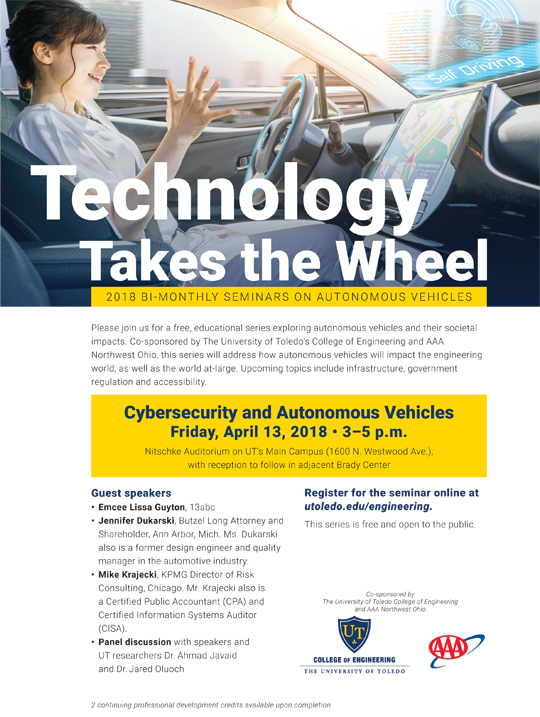 The seminar focused on cybersecurity and autonomous vehicles will take place Friday, April 13, from 3 to 5 p.m. in UT’s Nitschke Auditorium. “We understand drivers have questions about the impact of artificial intelligence on transportation, and this is a great opportunity to talk about autonomous-vehicle technology and the work to prevent self-driving cars from being hacked,” said Dr. Jared Oluoch, UT assistant professor of computer science and engineering technology. Taylor Kia will have a 2018 Stinger on site that is equipped with forward collision avoidance; forward collision warning system; smart cruise control with stop and go; lane-keep assist system; lane-departure warning system; driver attention warning; high-beam assist; blind-spot collision warning; rear cross-traffic collision warning; and auto-ran sensing windshield wipers. Speakers will include Jennifer Dukarski, attorney with Butzel Long in Ann Arbor, who represents suppliers of autonomous vehicle technology, and Mike Krajecki, director of emerging technology risk consulting at KPMG in Chicago. Both speakers will participate in a panel discussion featuring UT engineering researchers and cybersecurity experts Oluoch and Dr. Ahmad Javaid. An autonomous vehicle will be on display for students to view inside the Nitschke Technology Commercialization Complex in the Brady Engineering Innovation Center from 1 to 2:30 p.m.
Register for the free, public seminar here. This entry was posted on Wednesday, April 11th, 2018 at 3:01 am and is filed under Engineering, Events, Research, UToday .